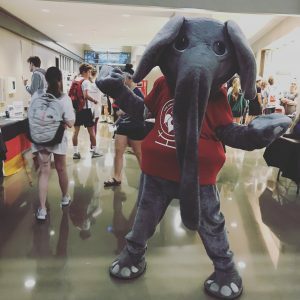 On Monday, February 19, the UA Education Abroad office hosted the Spring 2018 Study Abroad Fair at the Robert E. Witt Activity Center on the UA campus. The fair was an opportunity for students to talk with UA faculty, staff, and affiliated study abroad program providers about the options they have to study abroad as a UA student. More than 250 students attended the event, twice as many as attended last year. Students were able to earn a Greek point and spin to win prizes for attending the event. Information about how to use financial aid and scholarships to study abroad was also presented. Students can still apply to study abroad for the upcoming summer and fall terms, as well as Spring 2019. For more information, students can attend one of Education Abroad’s “Study Abroad 101” sessions held daily at 2 pm in 135 B.B. Comer Hall. Students can apply to study abroad on the Education Abroad website at www.studyabroad.ua.edu. Santiago Mejia Villegas, a native Colombian, was first exposed to American football, a rare sport in Colombia, during his time on the Alabama campus.“It is impossible to live in the campus during the football season and not getting involved in the Crimson Tide! I had the chance to go to a couple of games in the stadium as well as to the welcoming parade and live that amazing moment like a new fan of Alabama,” he said. “I have made a few friends with whom have been in some cities nearby or in some bars and restaurants here in Tuscaloosa,” he said. Villegas’ first language is Spanish, and he’s in Tuscaloosa to study English and business through the University of Alabama’s English Language Institute (ELI). Villegas graduated with a bachelor’s degree in economics and continued his postgraduate studies in marketing and finance in Colombia. There are so many differences between the way we live in [my] country and the way we live here because we are temporarily a student and we have to face some situations like get used to the food, to stay at the dorm because we don’t have a car or friends to go out with… but at the end everything has become in a new valuable experience,” Villegas said. During his time at the University, Villegas has been active in the ELI, other international student groups and community church events. This past year, Villegas attended a Thanksgiving event hosted by a local church group where he said he learned cultural pieces he couldn’t have learned in a classroom. “There it was wonderful people and delicious food and it became in a very good opportunity to know and understand the origin of the holiday and its meaning for the American culture. It was also a place where we found good and friendly people who afterwards has helped us in some casual questions like where to find a barber shop close the campus or stuff like that,” Villegas said. While there are many people involved in the ELI program, Villegas said he believes not enough people know about it or are even aware of what they do in the program. He said he finds it easier to talk to people in the program because they speak multiple languages. “We designed [the program] specifically for non-native speakers who live in the Tuscaloosa area and want to improve their language skills,” Brown said. Brown said the program provides learners with the confidence they need in the English language to pursue opportunities they might not otherwise get the chance to pursue, whether that be personally, professionally, academically or socially. “For native speakers who don’t quite understand, I tell them [ELI] is similar to when maybe they learned Spanish or French in high school or college. It’s different, however, because our classrooms often include students who speak a variety of different languages,” Brown said. 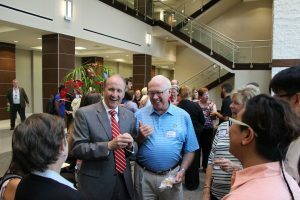 “Everything about the culture here is different and interesting in some ways, but definitely the friendly character of the people in Alabama is something I will never forget,” Villegas said. Wearing traditional Chinese garb and a panda hat, Jing Li stood Friday in the middle of a circle of intrigued students from University Place Elementary School. As the students watched, Li began to spin, kick and softly move across the floor, performing different martial art forms, such as tai chi and changquan. In the midst of her performance, Li stopped. “You want to see more?” Li asked. “Yeah,” the group shouted with excitement. Li’s performance was one part of a showcase at the school Friday morning that included representatives from 16 different countries to commemorate International Education Week. 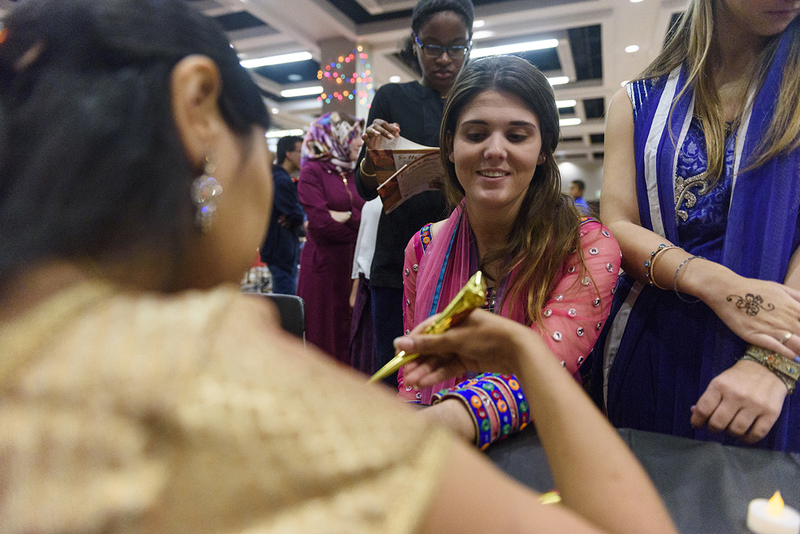 The showcase, which was organized between the school and the English Language Institute at the University of Alabama, was called “World Friends Day” and included people explaining their cultures and what makes their country unique. The forum was organized after Monica Hollie, a receptionist at ELI and a parent of two students at University Place, approached the school about holding an international forum there. ELI works with University of Alabama students who come from across the globe in improving their English skills. The group normally holds forums at different schools throughout the year to teach children about different cultures. Hollie said that as much as the forum is for the children, it also helps out the ELI fellows. “Their first language is not English, and they are here to improve their skills in that area,” Hollie said. Zion Doughty, a third-grader at University Place, said he liked learning about different countries, such as Jordan. “It seems really cool,” Doughty said. McGahey said that University Place has many students who live at or below the poverty level, and they may not have had a chance to see the world or understand how other people live in the world. “By exposing them to other countries, it broadens their experience to what they can do later in life,” she said. Hollie said that more than just exposure to cultures, forums like the one on Friday help children relate to others in the world, in addition to making people from other cultures feel like they are understood in the process. College football games in the Southeastern Conference can start as late as 8:30 p.m. CST, and sometimes push through midnight. It’s a minor inconvenience for University of Alabama football supporters, whether they’re in Bryant-Denny Stadium or watching the game remotely. Time constraints, travel, lodging and ticket expenses – it’s all worth it to see the Crimson Tide win – and win a lot – right? 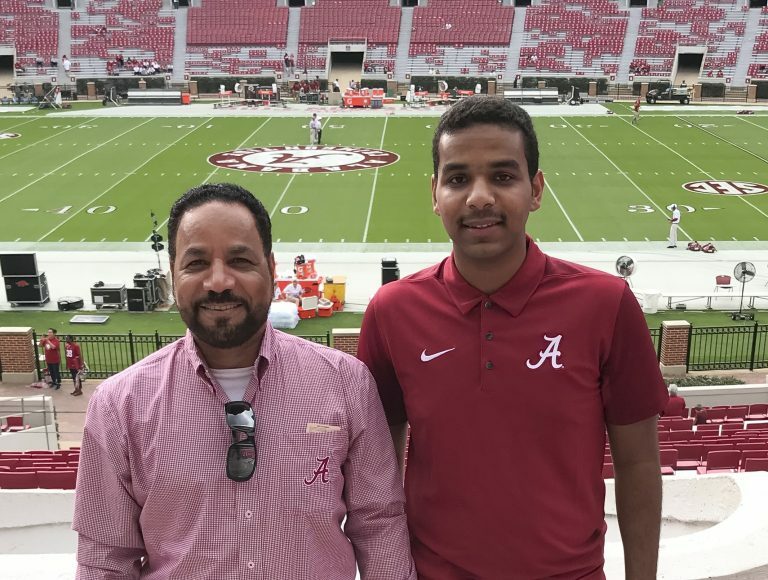 In Saudi Arabia, eight hours ahead of Alabama and the Central time zone, Yahya Al-Bokhedaim and his son, Shahaeen, fight sleep each week to watch UA’s prime-time matchups. The CBS games offer a reprieve from the overnight viewings, but during late games, Shahaeen often leaves for school without knowing the final score. Shahaeen, who recently enrolled in UA’s English Language Institute, will no longer wonder who won the game – or Alabama’s margin of victory. He’s taking the same path Yahya took in the early 1980s: learn both the English language and chemical engineering at UA. Yahya arrived at UA in 1983, just a year after the ELI was established. He was one of five Saudi students sponsored by oil company Saudi Aramco. Yahya has worked for Saudi Aramco since earning his bachelor’s degree in chemical engineering in 1988. Yahya soaked in American culture and Southern hospitality during his five years on campus, a transition that was aided by a young, energetic ELI staff, he said. Yahya visited UA during homecoming week to help move Shahaeen to campus. It was Yahya’s first visit to campus since 1998 and only his second return to his alma mater since he’d graduated. Campus has grown, and there are “so many sidewalks and bike lanes,” but the same charm and “sweet home” he experienced in the 1980s existed the moment he stepped on campus, he said. A familiar face greeted him when he visited the ELI. “I was so happy to see the growth of the ELI – it’s become an excellent center,” Yahya said. “And it surprised me when I saw Mr. (Bill) Wallace, who is now the director. He used to be a teacher at ELI, but he remembered who I was. For them, it’s been 30 years, and they’ve had so many students come and go, so for him to have this memory of me shows how much he cares about people. 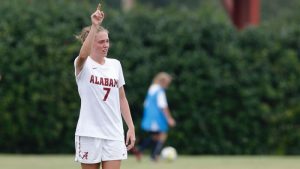 In a great article, ESPN recently highlighted the achievements of UA international student, Celia Jimenez Delgado for her efforts on the football pitch and in the classroom, where she studies Aerospace Engineering. On Tuesday, September 26, President and Mrs. Stuart Bell and Associate Provost, Dr. Teresa Wise hosted UA International Students and Tuscaloosa’s International Friends at the Ferguson Student Center Great Hall for a reception. President Bell took the opportunity to recognize the achievements and success of international students at UA as well as to thank the many families of Tuscaloosa’s International Friends for their commitment to international education at UA. President Bell meeting and interacting with international students and the Tuscaloosa International Friends families. On Saturday, September 23, International Student & Scholar Services and a large number of UA international students and scholars joined with the international offices and students of The University of Alabama at Birmingham, The University of West Alabama, Jefferson State Community College, Gadsden State Community College, Birmingham-Southern College, and Samford University for an amazing day of outdoor activities and fun. 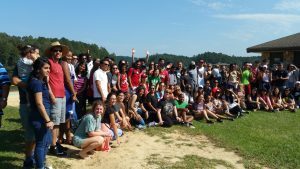 The International Cultural Retreat was held at Oak Mountain State Park, where students were able to play games, hike, enjoy nature, and make friends with other students from across the state. The ELI is proud to announce that our Intensive English Program has been accredited by CEA, the Commission on English Language Program Accreditation, through August of 2027. CEA is the accrediting agency for English language programs in the U.S and is recognized by the U.S. Secretary for Education. Accreditation reflects the ELI’s adherence to professional standards of excellence in areas such as student services, administration, and program design and curriculum. This accreditation comes after an extensive period of work and review by all ELI faculty and staff, led by Self-Study Coordinator Kelly McPherson. It also continues the ELI’s tradition of being a professionally-engaged and accredited program. The ELI received its original 5-year accreditation in 2002 and a 10-year accreditation in 2007. The Day of Action harnesses the efforts of hundreds of volunteers willing to roll up their sleeves for one day each year to make a positive impact working at schools and nonprofits across the Tuscaloosa community. This year’s event on June 16 featured more than 400 volunteers pitching in with hammers, brooms, paint brushes and elbow grease at 29 locations. Projects included light office work, landscaping, painting, cleaning and organizing, and much more. The event is sponsored annually by the United Way of West Alabama. For the second year in a row The Capstone International Center participated in volunteer activities across the Tuscaloosa community. 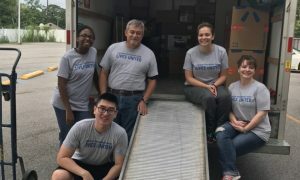 A team of 31 faculty, staff, and international students spent their time at five local aid agencies. 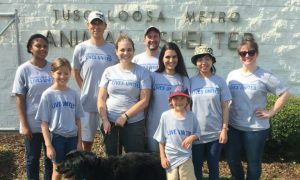 The Tuscaloosa Metro Animal Shelter, The Humane Society of West Alabama, The American Red Cross, Temporary Emergency Services, and the Easter Seals received Capstone International Center volunteers. Volunteers sorted donated items, washed dogs, cut back shrubs, loaded moving trucks, checked smoke detectors in the community, and learned about local organizations in the Tuscaloosa area.